How heavy are Netherton foundry spun iron pans? 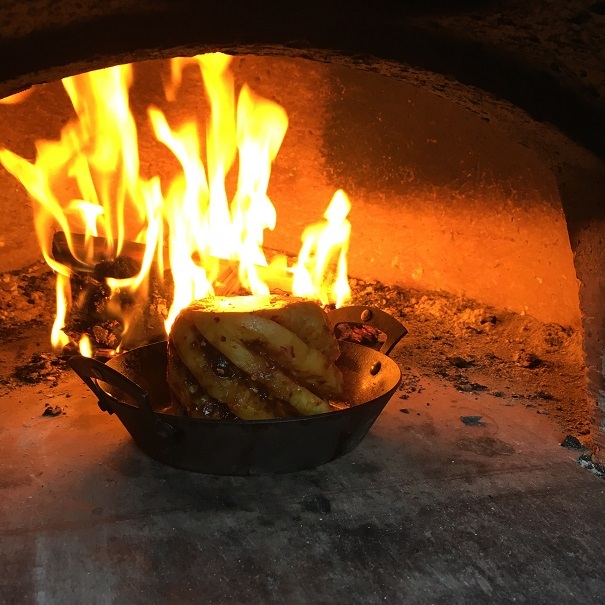 Cast iron is heavy, there are no ways around it but our spun iron pans are about half the weight of cast iron pans of the same sizes, simply because we can spin the black iron much thinner than we cast it yet still retain the great thermal properties or iron. The weight of all of our products is included in the product description on the website. We do use cast iron for casseroles, presses and some decorative items where weight is an advantage. How do we measure our frying pans? We measure the diameter of the pan across the top rim to describe the size. 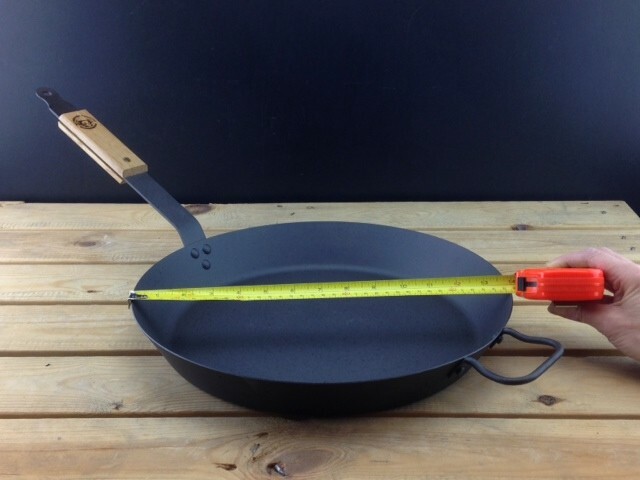 For example, if you put a ruler across the widest part of the top rim of our: 8’’ (20cm) Spun Iron Frying Pan NFS-111, it will measure 8 inches. If you look on the page for each product you will also find the other dimensions such as the base diameter (useful to know which ring it will fit on your hob) , pan height and weight . Our pans are made by hand and so measurements are approximate and no two are identical. Will my pan be ok on an open fire or in a wood fired oven? Absolutely, that's one of the great advantages of iron. Top tip: to keep pans flat always heat up the pan slowly from cold. Can I use the pan on induction? Yes, our spun black iron is very magnetic so works exceptionally well on all induction hobs. However all Netherton pan are hand made, so each one is unique. They will not all be as flat as a billiard table. Every time you use the pan heat SLOWLY from a LOW setting, before selecting high or full power. Use a hob/ring the same size as the pan base, small hobs/rings will warp big pans. Never drop a hot pan into cold water, this will buckle it. Seasoned pans don't have the same characteristics as those with chemical non-stick coatings. Unlike PTFE style coatings that get worse with use, the non stick properties of our seasoned pans improve with use; the more you use them the better they get. You will need oil/butter in the pan for cooking omelettes and fried eggs. If you are cooking sausages and bacon, the chances are that you will not need any additional fat, as the fat in the food will be sufficient and will also help to build up the patina of your pan surface. If you are cooking meat or fish, we recommend oiling the food, rather than the pan. Make sure the pan is hot before adding the food and that the food is at room temperature, not fridge cold. Be patient, allow your food to sear and seal on the underside before attempting to turn it over. If your food is sticking, it may be because it isn’t cooked enough. My pan has tiny flecks of black on the surface, what are they? You will see small specks of black on the pan surface when new, these are traces of cotton fibre that has been baked on during the seasoning process as we use washed cotton to apply the flax oil by hand, this is normal. They can be rubbed off with a washing up sponge. Seasoning is the black/brown coating on the surface of iron pans applied to prevent corrosion. Seasoning also stops food tainting, makes the pan surface slippery and easier to clean. Seasoning is usually a baked on oil but application and oil vary from country to country and are often subject to strong opinions and debate amongst food enthusiasts. Netherton Foundry cast and black iron cookware is pre-seasoned. We do not use chemical coatings such as PTFE & PFOA's. Therefore our pans do not have the potential health dangers from toxic fumes associated with high temperature cooking seen on many chemically coated cookware items. All our cookware is pre-seasoned at a high temperature with natural organic flax oil, which creates a durable, non-greasy Easy Clean Coating. If the natural flax oil coating becomes worn or damaged, you do not need to replace the item. We give you simple to follow instructions for restoring the surface. Do I have to season my pan before use? You can use them straight from the box. Simply wash in hot water. Do not use soap or detergent. Immediately dry, ideally on a low heat on the hob or in a warm oven. For best results we recommend that you give all cast black and spun iron bowls, lids, pans, cook and bakeware an extra seasoned coating before first use. The more you use the cast, black or spun iron and carefully follow the care instructions, the better the seasoned coating will become. You can do this by following our instructions for re-seasoning at home and watch our easy to follow videos. Which oils can I use for seasoning my pan? Netherton Foundry only recommends flax oil. We know that there are many other methods and oils are recommended over the internet and we haven’t tried everything. However have done our own long term testing and usage and find that flax oil is by far the best we have tested. Rapeseed oil, peanut oil and coconut oil are commonly used by others, but really suggest you do not use olive, sesame, generic vegetable or nut oils. You can buy our flax oil here. Can I put my pan in the dishwasher? No, it will rust and damage wooden handle. How do I wash my pan? Carefully read the sections: "Cleaning pre-seasoned cast iron, black and spun iron" and "After cooking and storing food"
Does cast and black iron rust? Yes it will if it's not cared for. Our pans are made from 99.1% pure iron, so if left damp they will inevitably rust. The best way to prevent rust forming is to keep them dry when not in use. However, should you get any rust on your pan, it can be restored to its former glory by re-seasoning. More information here: Re-seasoning and the care of cast, black and spun iron. Where can I buy a Netherton Foundry Pan? 1. You can buy from the shop on this website as we ship worldwide by courier every day. It's free delivery in the UK and cheap to Western Europe. Look here for more delivery information for all countries. 2. Check on our UK and worldwide stockist list for your nearest shop, but please call them in advance if you want something in particular, as they may not have everything we make in stock. PLEASE, PLEASE telephone us before you set off as we are not always open. Also sometimes we need to make the item you need before you arrive! I live outside Britain, how do I buy a pan? 1. No problem, we have a small but growing selection of worldwide stockists. 2. We also ship to any destination. Simply select your product in the webshop and the shipping cost will be calculated at the checkout. We principally use DHL for overseas deliveries and the cost of shipping is down to their rates. How long will it take for my pan to arrive? Can I return my pan if it’s been used? No, not unless it has a manufacturing fault. If your unsure if seasoned iron pans will suit you, we recommend that you talk to us before purchase. Please remember that how you season, heat and look after your pan is not under our control so please read and follow this care advice. Do we really make our pans in the UK? Absolutely, we make all of our pans in our workshops in Shropshire, a county in the middle England, bordering mid Wales. Warning, some cookware we know says “Designed in Britain” but is actually cast in France, other shiny pans claim to be made in the UK but are made of stainless steel from abroad with a handles screwed on from the Far East or Turkey, not really very much of them is British. How big is Netherton Foundry? Our business is privately owned by two families. At the time of writing we have 5 people making pans and two office staff, but we are growing! Can I visit Netherton Foundry workshops? Unfortunately it isn't possible to go into the workshop areas when we are working but you can see us making pans in this short video clip. PLEASE, PLEASE telephone us before you set off as we are not always open. Also sometimes we can make the item you need before you arrive! Do we do one off projects? We don't make gates, horse shoes or traction engines but if you need a special cooking or baking product, please contact us. We might be able to help or know someone who can. Can I become a Netherton stockist? If you have an outstanding independent retail outlet or website focusing on kitchen/ housewares items or specialist food, we would be interested in talking to you. Please note we never have multiple retailers on the same high street. We welcome enquiries from the UK and worldwide. Contact us here. Does Netherton Foundry supply restaurants, caterers and hotels? Definitely yes, you will find our pans in some of the swankiest kitchens and most exciting pop up restaurants. Contact us here.